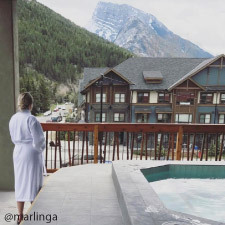 Filled with natural light and stunning mountain views, Banff’s newest spa, Meadow Spa & Pools (in The Moose Hotel & Suites), offers indulgent spa experiences in a tranquil environment. Services include massages, body treatments, facials, nail services, waxing and couples packages. Our peaceful relaxation lounge and private outdoor hot pool complete your spa escape, allowing time and space to relax and rejuvenate. Access to the hotel’s fitness centre, sauna and rooftop pools with panoramic views are complimentary on the day of your spa visit. 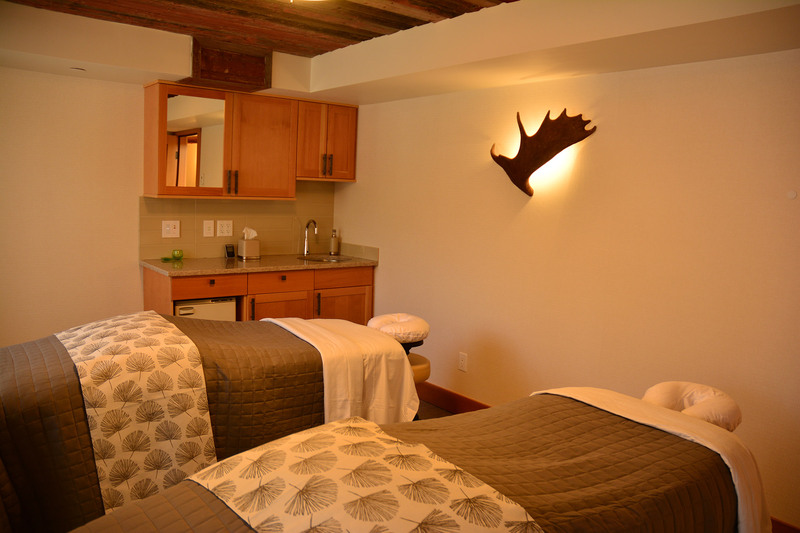 Meadow Spa + Pools is located in the Moose Hotel & Suites at 345 Banff Avenue. The spa’s typical hours of operation are 10:00 a.m. – 8:00 p.m. (hours may vary slightly according to the season) Spa treatments available daily. With most spa services, guests have complimentary access to the Spa, rooftop pools, sauna and fitness facility during their visit. Treatments, descriptions, and prices all in one place. The staff at Meadow Spa was amazing, they were very prompt with our services, made sure we were comfortable and both the massage and facial were excellent. We had a very nice time there and would recommend it to anyone visiting Banff. An amazing get away for both locals and tourists. Booking a spa treatment gives you access to a privat outdoor hot tub and also the rooftop hot tubs overlooking the mountains. This is the third time my wife and I have booked a treatment here and we will keep coming! I visited one afternoon for a massage which was excellent. Spent about 3 hours total enjoying the facilities, especially the roof top hot pools and sauna with fantastic views. Jumping back and forth from hot pools to cold mountain air was super refreshing. Staff was excellent and all amenities were well-appointed. We had a wonderful couples massage. Beth ensured that I was positioned comfortably for my first prenatal massage and did an amazing job soothing my tired muscles from the pregnancy and hiking. My husband had a deep tissue massage and said it was one of the best he’s had. 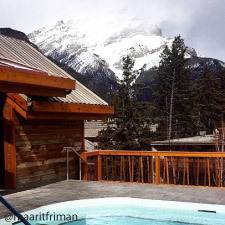 Afterwards we enjoyed the spa amenities including the spectacular views of downtown Banff from the quiet and private pool decks. Time and money well spent! My wife and I are in Banff for our honeymoon, and have made multiple stops at Meadow Spa and Pools. While our two couples massages were very different — one was given by male massage therapists and another by female… and there was a very noticeable difference in the softness of the massage haha — they were both very relaxing and enjoyable. The aura of the whole place is very comforting, and even just sitting out on the porch in the pool is well worth the time. The reviews on trip advisor were very good, but I was still pleasantly surprised with the Spa. The service and atmosphere were exceptional. We all enjoyed ourselves and didn’t want it to end. We are already planning our next visit. If you are in Banff, make the time to visit Meadow Spa and Pools. You definitely won’t regret it. P.S. Get there at least 45 minutes early so that you can enjoy the roof top hot tub. Whilst travelling I needed a massage as I was feeling a bit sore in my back and shoulders. My tour director recommended this Spa, and I received an excellent massage from a lovely lady. I would recommend this Spa with no hesitation. Beautifully appointed, relaxing, and a good variety of treatments. Many thanks! Wonderful spa! My Mom and I agree that the massages and facials we had here were absolutely amazing! 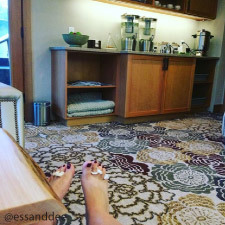 I really enjoy coming to Meadow Spa. Second time here for a massage and these have been the two best massages I’ve had. Also enjoy the private hot tub afterwards. Went to the spa for the day whilst my husband skied. Best decision ever! Had a aromatherapy massage and then hung out at the spa and later in the hotel hot tubs. I had the best day! The staff were friendly and professional and the spa really was special and had a relaxing atmosphere. They provide sandles and a robe. There is hairdryers and hair straighteners in the changing room. Such a relaxing atmosphere, the staff were very pleasant and the massage i received from Courtney was nothing short of perfect! The rooftop hot tubs and sauna are amazing and the views are out of this world. 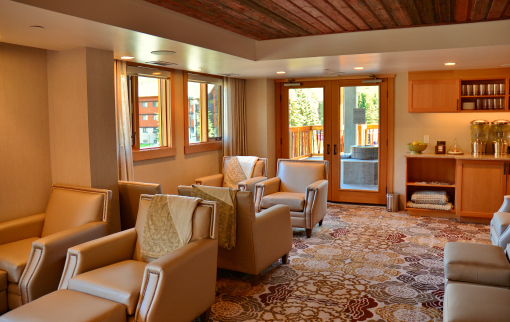 Definitely worth a visit to this jewel in the Rockies for some serious pampering! We suggest arriving to the spa 20 minutes prior to your scheduled service to check in and enjoy the lounge and pool area. To accommodate all guests, each treatment will conclude at the scheduled time. Gratuities and taxes are in addition to the spa priced listed. 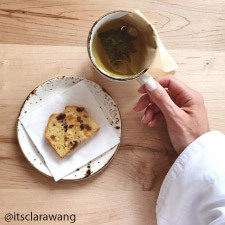 Gratuities are at your discretion and 5% GST will be added to all prices. Group bookings are subject to an 18% gratuity. Prices are subject to change without notice. 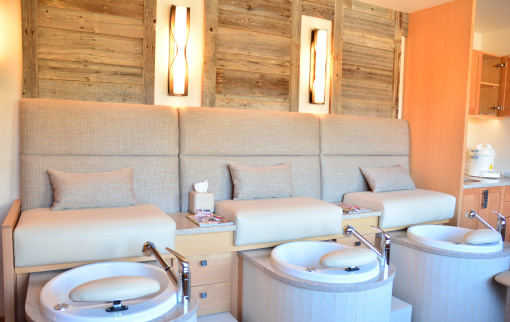 We allow access to our spa services and facility for those 16 years of age and older. To maintain a relaxing spa environment, and to allow you to make the most of your spa experience, we encourage all guests to turn off their cell phone and leave them in their locker for the duration of their spa visit. A robe and sandals will be provided to you in addition to a locker to store your personal belongings. A swimsuit is required in the pool areas. A form of payment is required to hold all appointments. If you must reschedule or cancel your spa service, 24 hours notice is required to avoid a 50% charge.